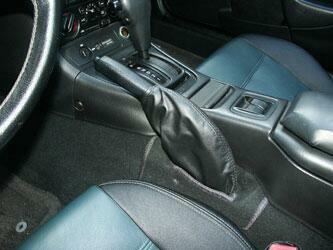 The East Coast Miata Leather Brake Boot is a High Quality Leather Boot for your parking brake. There is not a better boot made anywhere, period. Other boots are simply sewn, and use poor quality leather. Ours is hand sewn with French seaming as appropriate to a sports car, and we use only high quality leather. Makes a Great Gift for any Miata enthusiast...like yourself! Installs in a few minutes and gives your Miata cockpit the look, feel, and smell of real leather. This boot is Quality Made in USA. This Boot will fit all 1990-2005 Miata's. Price: $29.95 Each + $8.00 Shipping.